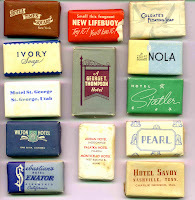 French Soaps: Hotel Soap ,What to Do With Hotel Soap? Hotel Soap ,What to Do With Hotel Soap? They are all from the 1940's and 50's era. The following letters are taken from an actual incident between a London hotel and one of its guests. The Hotel ended up submitting the letters to the London Sunday Times! Please do not leave any more of those little bars of soap in my bathroom since I have brought my own Natural handcrafted Soap. Please remove the six unopened little bars from the shelf under the medicine chest and another three in the shower soap dish. They are in my way. I am not your regular maid. She will be back tomorrow, Thursday, from her day off. I took the 3 hotel soaps out of the shower soap dish as you requested. The 6 bars on your shelf I took out of your way and put on top of your Kleenex dispenser in case you should change your mind. This leaves only the 3 bars I left today which my instructions from the management is to leave 3 soaps daily. I hope this is satisfactory. Dear Maid - I hope you are my regular maid. Apparently Kathy did not tell you about my note to her concerning the little bars of soap. When I got back to my room this evening I found you had added 3 little Camays to the shelf under my medicine cabinet. I am going to be here in the hotel for two weeks and have brought my own natural handcrafted soap so I won't need those 6 little Camays which are on the shelf. They are in my way when shaving, brushing teeth, etc. Please remove them. My day off was last Wed. so the relief maid left 3 hotel soaps which we are instructed by the management. I took the 6 soaps which were in your way on the shelf and put them in the soap dish where your Dial was. I put the Dial in the medicine cabinet for your convenience. I didn't remove the 3 complimentary soaps which are always placed inside the medicine cabinet for all new check-ins and which you did not object to when you checked in last Monday. Please let me know if I can of further assistance. The assistant manager, Mr. Kensedder, informed me this morning that you called him last evening and said you were unhappy with your maid service. I have assigned a new girl to your room. I hope you will accept my apologies for any past inconvenience. If you have any future complaints please contact me so I can give it my personal attention. Call extension 1108 between 8AM and 5PM. Thank you. It is impossible to contact you by phone since I leave the hotel for business at 7:45 AM and don't get back before 5:30 or 6PM. That's the reason I called Mr. Kensedder last night. You were already off duty. I only asked Mr. Kensedder if he could do anything about those little bars of soap. The new maid you assigned me must have thought I was a new check-in today, since she left another 3 bars of hotel soap in my medicine cabinet along with her regular delivery of 3 bars on the bath-room shelf. In just 5 days here I have accumulated 24 little bars of soap. Why are you doing this to me? My Natural handcrafted Soap. soap is missing. Every bar of soap was taken from my room including my own natural handcrafted soap. I came in late last night and had to call the bellhop to bring me 4 little Cashmere Bouquets. Who the hell left 54 little bars of Camay in my room? I came in last night and found 54 little bars of soap. I don't want 54 little bars of Camay. I want my one damn bar of natural handcrafted soap. Do you realize I have 54 bars of soap in here. All I want is my natural handcrafted soap. Please give me back my natural handcrafted soap. On the shelf under medicine cabinet - 18 Camay in 4 stacks of 4 and 1 stack of 2. On the Kleenex dispenser - 11 Camay in 2 stacks of 4 and 1 stack of 3. On the bedroom dresser - 1 stack of 3 Cashmere Bouquet, - 1 stack of 4 hotel-size Ivory, and 8 Camay in 2 stacks of 4. Inside the medicine cabinet - 14 Camay in 3 stacks of 4 and 1 stack of 2. In the shower soap dish - 6 Camay, very moist. On the northeast corner of tub - 1 Cashmere Bouquet, slightly used. On the northwest corner of tub - 6 Camays in 2 stacks of 3. Please ask Kathy when she services my room to make sure the stacks are neatly piled and dusted. Also, please advise her that stacks of more than 4 have a tendency to tip. May I suggest that my bedroom window sill is not in use and will make an excellent spot for future soap deliveries. One more item, I have purchased another bar of natural handcrafted soap which I am keeping in the hotel vault in order to avoid further misunderstandings.